Fill in the blanks with adjectives that are opposite in meanings to the adjectives that are highlighted. The mouse is small but the elephant is …………….. .
Roy is strong but Mrs. Roy is ……………. .
Reena is short but Tina is ……………. . These sums are easy but those ones are ……………. The butterfly is beautiful but the cockroach is ………………. .
Sita is thin but Simran is ……………. . Hair is black but the tooth is …………….. . Tea is hot but juice is …………………. Watch and learn the concept of adjectives with CBSE Class 2 learning videos. Complete the following sentences by choosing the correct describing word. 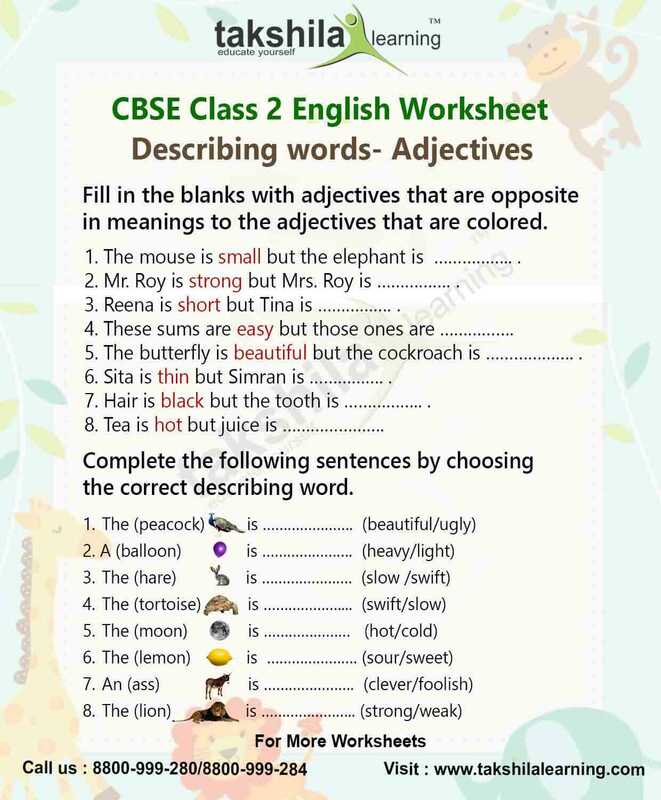 Find out more worksheets and quizzes for learning, Click CBSE Class 2 English for details. Make your kid’s concepts clear and build a strong learning foundation with the innovative and entertaining curriculum. It does not only help you in school courses but also helps in developing your brain & Skills development. Learning packages are available for Nursery to Class 12. Register now with www.takshilalearning.com for more details.